As people arrived at the Boatwerks Restaurant in Holland, Michigan to attend the anniversary meeting, it was almost impossible to miss the location unless you let your blind friend drive you over. Peter Hledin, of Skater Powerboats, was generous enough to lend the event his Miami Boat Show 3312 Skater. This was sitting right at the entrance to the restaurant parking lot. The boat had just finished its shakedown initial run a couple days earlier, (stay tuned for updates on that shakedown), and was ready to head out to Lake Havasu for Desert Storm. Special thanks to Tyson Garvin who was kind enough to tow it from, and return it to, Skater. As the meeting got under way, shortly after 7:00, club President Chris Dekker, along with board members Jeff Tibbe, Roger Zuidema, and Kevin Alferink, talked about the accomplishments of the previous year, and reviewed the plans for this year’s events and goals. There was also a lesson on safety, (including speed limits on the local lakes the club utilizes!! ), from the Coast Guard. As said in the beginning, it’s not just about performance boating fun. In attendance at the event were representatives from the local Make-A-Wish Foundation with a couple of Wish recipients. As many of us already know, Make-A-Wish tries to grant all possible wishes to children who have life threatening illnesses. Make-A-Wish Michigan has been able to grant over 8500 such wishes, and continues to do all possible to make those kids wishes come true. As the Make-A-Wish people talked about the foundation, and then what the ability to have a wish granted to make extremely difficult problems ease a little bit for a short period of time, the importance of how performance boaters try to assist with helping those in need really begins to sink in. But, when the young kids talk about what their issues are, and how having their wishes granted means so much, a peek around the room at the tears welling up in eyes says more about the hearts of those helping than any words could ever say. 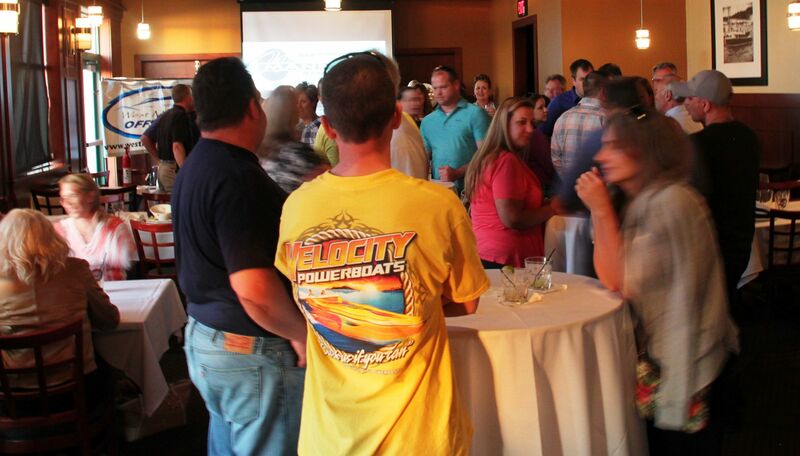 After the business portion of the meeting, the members and guests chatted about the previous year, the upcoming events, and the usual, (sometimes slightly embellished), boating experiences and upcoming plans. Many went into the Boat Werks to have dinner. They are one of the premier waterfront restaurants in all of West Michigan and are a place where all that have a chance to, should swing by to have a meal. They also have a premium location to watch the sunset over Lake Macatawa and are definitely boater friendly. Stop by and check it out when you have a chance. As this second year occurs in the evolution of West Michigan Offshore, one of the things they are most looking forward to is being able to give even more to those less fortunate than they were able to their first year. We certainly are with them in their endeavour to show the world that there is much more to their performance boating passion than selfishness and fun. Our heartfelt congratulations to them for making the time to help others also have the ability to have their wishes fulfilled for their fun times. Safety oversight from the U S Coastguard.